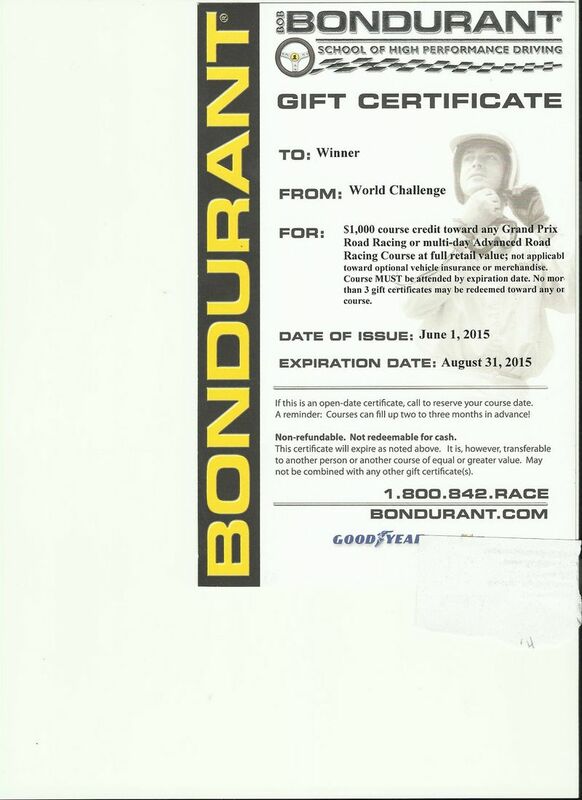 Have for sale, 2 $1,000 Gift Certificates for the Bondurant Road Racing School or multi-day Advanced Road Racing Course. The course must be booked between June 1, 2015 and August 31, 2015. I am selling the 2 certificate for $700. Anyone interested, please email at cup944@aol.com or call 240.412.5520. For the GP course, beginners can enroll but must be proficient with a manual transmission. The 3 day course is in a Corvette C7 Stingray. The last day in the 4 day course, you drive an open wheel Formula Mazda car. After completing the 4 day course, your experience will be noted in a logbook and with your Instructors endorsement, you will be able to go right on to an SCCA Regional race license. The 2 or 3 day Advanced Road Racing Course is personalized instruction, real-world race scenarios and nearly five hours of seat time per day in a Corvette Grand Sport.